A million excuses can block you from achieving your sales and income goals. A tough economy, Internet price-cutting, skeptical customers . . . you name it. But consider this: The top 20 percent of salespeople reel in 80 percent of sales, no matter the obstacles. They get predictable, exemplary results in fluctuating conditions. And you can too when you master the all-time best sales techniques ever created! 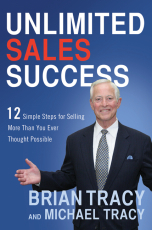 • How to ensure repeat sales in our "recommendation nation"
Self-assessments, sample dialogues, stories that demonstrate great selling in action, helpful exercises, and Brian Tracy's trademark jolt of inspiration will all hammer home the book's inval­uable ideas and techniques and help you quickly adopt them as your own. All great salespeople start at the bottom, un­skilled and insecure. They learn to excel not by using tricks or so-called "secrets" -- but by ma­tering the tried-and-true sales skills that consistently deliver the performance and earn­ings you've always dreamed of. Put these skills to work -- and enjoy your rewarding journey to the top.